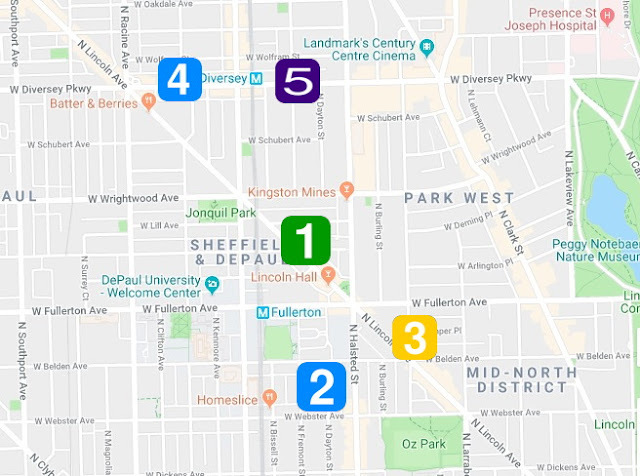 Two armed men pulled off a series of five robberies in less than an hour Saturday evening in Lincoln Park, then led police on a chase along the CTA’s elevated Red and Brown Line tracks before being arrested, according to Chicago police and multiple sources. No one was injured in the crime spree or the dangerous foot pursuit. Five separate victims reported being robbed in the area east and north of DePaul University between 8:15 p.m. and 8:45 p.m. yesterday. All of the victims reported that offenders wearing masks approached them on the street, displayed a handgun, and demanded their property. The hold-ups were reported near the intersection of Montana and Lincoln at 8:15 p.m.; in the 800 block of West Webster at 8:23 p.m.; near Lincoln and Belden at 8:25 p.m.; in the 2700 block of North Seminary at 8:43 p.m.; and near the intersection of Diversey and Wilton at 8:45 p.m.
Chicago police released details of the final hold-up at Diversey and Wilton, saying that a 47-year-old man was walking in an alley in the 800 block of West Diversey when a gunman approached him, displayed a handgun and asked, “what you got?” The offender then ordered the victim to turn around and asked, “where’s your money?” The gunman went through the victim’s pants and took the man’s phone, cigarettes, $20 cash, and a backpack, police said. After the robbery, the gunman told the victim to keep walking and no to call the police. But four other victims had already called the police and officers spotted the gunman at the Diversey station less than a minute later. At least one offender then ran onto the train tracks at Diversey and headed northbound. Police took the man, 22, into custody between the Diversey and Belmont stations about 30 minutes later. A firearm was also recovered. and officers found proceeds that had been taken from the robbery victims. No details were yet available regarding charges in the robbery spree. CWBChicago will post an update when that information is finalized.